When one approaches a film with a certain set of expectations based on the individual components and what it could potentially add up to as a whole it gives way to a certain direction we think the film will go. From the outside looking in The Drop starring Tom Hardy and James Gandolfini in his final screen role sold itself as a Brooklyn-based crime drama that centers around a robbery gone wrong and the investigation around the robbery that brings a certain drop-point system to its knees. While all of this is still very much a part of the film, it isn't the centerpiece, as an audience we aren't drawn into the plot as in the series of events that make up the story, but instead become more interested in how these specific characters will decide the course of the story rather than the tropes typically employed in this genre. To be fair, it is a deliberately slow-paced affair that sets the tone of not only the critical environment in which the movie takes place, but the attitude of our main character and how it lines up with the aforementioned plot elements that combine to bring home more than we bargained for in the third act. As the film goes on and we wonder why the tension never reaches breaking points with the police involvement or why more things, shocking things aren't happening we are getting a portrait painted for us and we don't even realize it until director Michaël R. Roskam wants us to. There are core questions people have to ask themselves when put in a predicament such as Bob Saginowski (Hardy) is here. What is his overall goal in life? What is standing in his way? What might he lose if he doesn't achieve his goal? They are questions that Dennis Lehane no doubt asked himself as well when he penned both the screenplay and his short story the film is based on. These questions though, ones that typically provide a kind of structure for where a story needs to go, while still in place, are allowed to become side-tracked and thus result in a film where it doesn't feel we are dipping in on a very specific moment in time in the life of the characters, but that this is simply another set of struggles, another set of detractors and minor set-backs in a neighborhood where everyone is fighting to make a living and maybe one day, achieve their ideal goals. Nadia (Noomi Rapace) helps Bob (Tom Hardy) take care of his new dog, Rocco. We meet the mild-mannered Bob as he tends bar at his cousin Marv’s (Gandolfini) local Brooklyn joint. He buys the boys a round of shots as they are out celebrating or more remembering the life of a friend who's now been gone a decade. Bob buys the guys a round and lets an older, female regular sit in her spot every night despite a rising tab and no hope of it getting paid. He likes to give people hope, but Marv is still in it for the business and can't hardly deal with Bob's easy-going nature. The catch comes in the form of the fact that despite the bar still being named Cousin Marv’s, it's actually been owned by the Chechen mob for years and serves as a “drop” spot for laundering illegal gambling money. One night, after the bar has closed it is held up at gunpoint and taken for over five thousand dollars. Obviously, the Chechens are not happy about losing a good portion of their money and so it is Bob and Marv’s responsibility to track down the guys who robbed them and the money that doesn't belong to them. Soon after this oddly timed stick-up, Bob comes across an abandoned and abused puppy in a trash can outside of Nadia's (Noomi Rapace) place. Though she is at first suspicious, Nadia quickly sees that Bob is harmless in terms of the type of guys she is accustomed to dealing with. Nadia helps clean the pit bull puppy up, but can't keep it at her place forcing Bob to take the dog with him and take on a kind of responsibility he clearly didn't see coming into his life. In the process of learning how to take care of a dog and manage the needs and wants of a dependent Bob forms a somewhat unexpected, but very natural relationship with Nadia. It is when Eric Deeds (Matthias Schoenaerts), Nadia's old boyfriend and local thug, shows up threatening to call the authorities to get his dog back or forcing Bob to pay him ten grand to keep it as well as Detective Torres (John Ortiz) getting hot on the trail of the missing money that things intensify and Bob is put in a position where no choice and no one to turn to leads to no good news for anyone involved. If that summary sounds somewhat vague that's because it is. It is so critical to the experience of the film that the shadings of the characters be kept something of a mystery to the point I am hard-pressed to say anything more concerning the story, but it is in the performances that these characters and their situations breathe an air of authenticity. When I say the "shadings" of the characters it is in reference to the multi-faceted ways in which they exist in this world of unwritten rules. They may seem to be a certain kind of person on the surface, maybe intentionally, but everyone we come across here has deeper motives, darker secrets and care little about the ultimate cost of what must happen if it means they survive the longest in the end. Leading this charge of apparent planes with many faces is Hardy's Bob. Hardy, who never fails to impress is somehow able to create a unique character every time he appears in something despite cutting out a very distinct personality for himself. Whether you saw him first in Bronson, Warrior or The Dark Knight Rises you were given the impression of this hulking figure, a brooding type that went from extravagant insanity (Charles Bronson) to a game of quiet intimidation (Tommy Conlon) through to a thoughtful tyrant (Bane). Regardless, there was a theme here in that his physical presence was always a shadow creeping up on whatever personality he chose to imbue within that structure. Then, of course, you remember he's the charming one in Inception and you begin to wonder just how much he is capable of. He added more shades to the hulking, brooding presence as Forrest Bondurant and only earlier this year was a man of no exception, of no physical prowess, but simply a struggling schlub of a man in Locke. In Bob Saginowski Hardy has concocted a somewhat dim-witted man who takes in his life and those around him in a very matter-of-fact, literal nature. Hardy portrays him in a way where we get to know, even feel comfortable with Bob only to trust him even more because while we don't necessarily know what he is capable of, we know he will do what needs to be done. 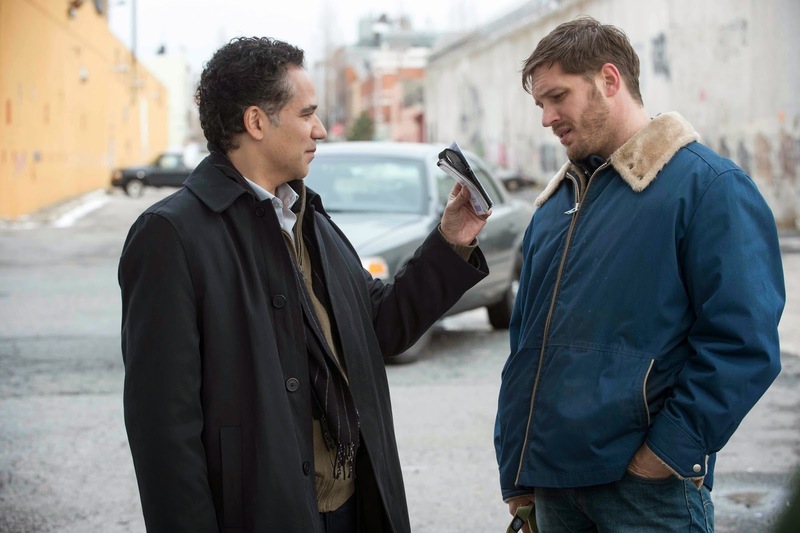 It is on Hardy's shoulders that The Drop is as successful as it is in navigating through a plot-driven genre with a character-driven story. Detective Torres (John Ortiz) has a few questions for Bob concerning the robbery at his cousins bar. 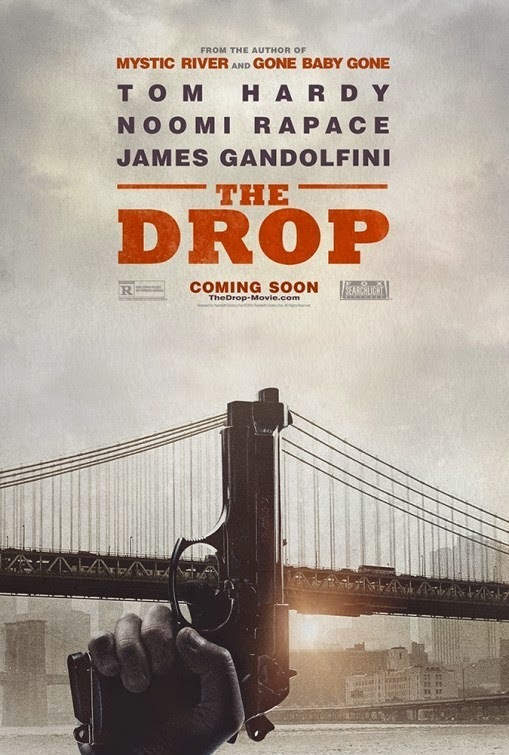 Did I expect for The Drop to consist mainly of a developing relationship between a man and his new dog that serves as a bridge for closer, more human interaction? No, not really, but coming away from it (as opposed to what I expected going in given all attributing factors) that is what I enjoyed so much about it: the unexpected calm of its subtlety's and the fact it could be described with such a word at all. Over the past few years I have become more accustomed to the slow-burn crime drama and I love the atmosphere in which they operate and the speed at which they lay out their themes and then take you for a bullet-riddled ride that puts all thought out the window to display the thoughtfulness of art that can be taken away with such thoughtless execution. The Drop hammers into this idea of survival, of the calm within the storm while never letting the storm take over. I would also be remiss if I didn't mention the late James Gandolfini doing what he does best in a role that could have very easily been thrown aside or camped-up to an extreme. Instead, Gandolfini displays his inherent knack for this type of character by playing it by the numbers-a man who thinks he knows better, but can't see past his own satisfaction to the perspective of what has happened before and what will happen a million times more to guys just like him. Rapace is in the same boat, though Nadia is clearly aware of her situation and has the intelligence to simply want to steer clear of anything that might cause complication in her life. She plays the character with such simplicity though it is hard to pick up on anything special, anything different in the way Hardy proves himself to be unique. In this fashion though, Rapace delivers just what the film needs while her specific look and general style give her a genuine feeling of home in this underbelly of Brooklyn tale. Schoenaerts and Ortiz are fine here as well, though Ortiz is given surprisingly little to do and Schoenaerts (who is the star of Roskam's only previous feature, Bullhead, which I hear I need to check out) pushes his insane Deeds to the point of uneasy without going overboard. It would be easy to go into several other, small characters portrayed in impressionable ways that add even more layers to the story of those already mentioned, but what is best is to allow The Drop to take you in, demonstrating how well a standard film can be executed in alternate, interesting fashions.